An out-of-state visitor with measles traveled to Northern Arizona. They were potentially contagious from August 6–8, 2018. There are currently no cases of measles in Arizona. However, this visitor may have exposed the public at the following locations during the listed times. As public health continues the investigation, these locations could be expanded. Slide Rock State Park, 6871 N. AZ-89A, Sedona, AZ 86336, from 12:30 p.m. to 5:30 p.m.
Enchantment Resort, 525 Boynton Canyon Road, Sedona, AZ 86336, from 5:30 p.m. to 10 p.m.
Pump House Station Urban Eatery and Market, 313 AZ-179 D10, Sedona, AZ 86336, from 12:10 p.m. to 3 p.m.
Redrock Precision Motors, 1425 W AZ-89A, Sedona, AZ 86336, from 1 p.m. to 3:15 p.m.
Enterprise Rent-A-Car, 2090 AZ-89A, Sedona, AZ 86336, from 1 p.m. to 4 p.m.
Tlaquepaque Arts & Crafts Village, 336 AZ-179, Sedona, AZ 86336, from 6 p.m. to 8:45 p.m.
Rene at Tlaquepaque, 336 AZ-179, Sedona, AZ 86336, from 6:15 p.m. to 10:45 p.m.
Cracker Barrel Old Country Store, 3520 Stockton Hill Road, Kingman, AZ 86409, from 8 a.m. to 10:45 a.m. Measles begins with symptoms which include fever (101 degrees Fahrenheit or higher), red, watery eyes, cough and runny nose. A rash that is red, raised and blotchy appears after several days. The rash begins on the head at the hairline and moves down the body. People infected with measles can be contagious up to four days before the rash appears, when people may not recognize they have measles. If you do not have a health care provider, you may need to be seen at your local hospital emergency room or urgent care center. Please call before going to let them know you may have measles. For more information on measles’ signs and symptoms or where you may find vaccine, please check with your healthcare provider or your county health department. Medical questions should be directed to your health care provider. 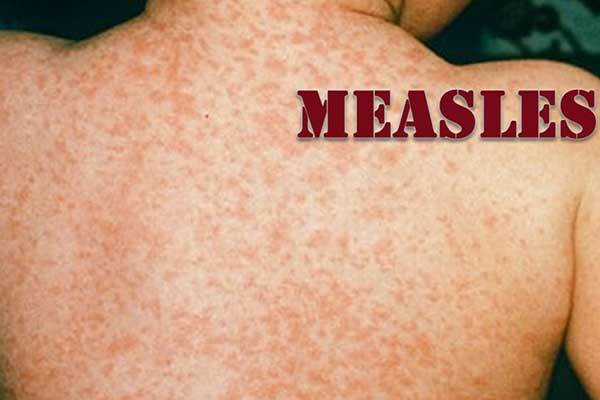 For more information about measles, please see azhealth.gov/measles.